(Bloomberg) -- Goldman Sachs Group Inc. says that “fear” has made a comeback and gold is benefiting as stocks slide and investors fret more about the possibility that the U.S. economy may tumble back into recession. 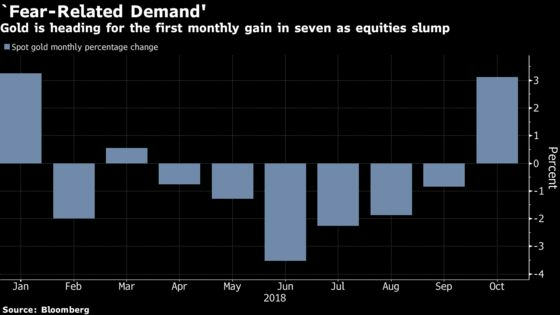 Bullion is heading for the first monthly gain in seven after equities slumped and trade-war concerns festered, hurting the outlook for growth. The U.S. has a greater than 50-50 chanceof tipping into a recession in the next two years, according to a model tracked by JPMorgan Chase & Co. The spike in market worries on the possibility of a recession have been the primary reason behind a rebound in gold investment demand, according to Goldman.